British inventor Christopher Cockerell carried out experiments during the early 1950s with a device that later became known as the hovercraft. The basic principle is that a vehicle can rest on a cushion of air and propellers can provide forward motion. He built a prototype in 1955 but the air force claimed it was a ship and the navy claimed it was a plane. Eventually the British Government became interested and classified it as top secret. The British Government provided funding and in 1959 a prototype hovercraft was unveiled. A month later the prototype crossed the English Channel which showed the technical durability of early hovercrafts. 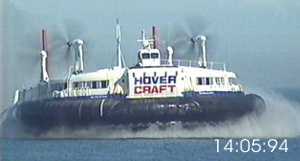 Many people at the time referred to the hovercraft as like a flying saucer. The basic operating principle can be seen in the animation. A propeller drives air down a hollow skin. The air inflates a rubber skirt with some air escaping through holes to produce a cushion of air underneath the hovercraft. The early prototypes did not have the rubber skirt and this meant they were difficult to direct and they could not get over obstacles greater than ten inches in height. The skirt greatly improved this situation with obstacles no longer being a problem. The British military carried out extensive tests on the final design. It was tested under all types of conditions including crossing deserts, artic regions, rivers and seas. It proved to be successful. The first passenger service began in 1962 between the English seaside resort of Wallasey and South Wales. At 70 mph, the 40 mile crossing took approximately twenty minutes and compared the a typical ferry of the time, the speed of the hovercraft was a vast improvement. The largest passenger hovercraft in the world was used for the Dover to Calais crossing from the 1960s for nearly 40 years. 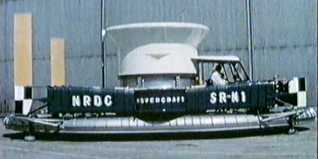 The SRN4 was the largest passenger hovercraft in the world capable of carrying over 380 passengers and 40 cars. It was 91 feet wide and 185 feet in length and weighed 300 tons. The propellers were 20 feet in diameter and with its power it could cruise at 70 mph. It was the fastest ferry in the world.